Once again, I had a truly incredible experience! Faithful followers on my blog (all three of you) may have noticed that I haven’t raced since June. I’ve indeed been injured. Lymph node on pelvic bone? No. Broken hip bone? No. Stress fracture? No. Torn thigh muscle? No. Overuse and overtraining? Yes! I did have to see three different doctors, one physical and two massage therapists to finally reach this conclusion. I also had to take off three weeks from running. All of this happened just weeks prior to the race, and I had let my good friend Jim C., the team captain, know that I would not be running with the team. It wasn’t until just two weeks prior to the race that I let him know I would, in fact, be able run. It was quite an exasperating experience, to say the least. I did cross-train during my rest and recovery, biking four or five times a week, and continuing to focus on yoga. I think/feel that cross-training was the key to my recovery. Nonetheless, I certainly hadn’t put in the miles. Not for this race (races) or the upcoming Chicago Marathon. We were the 5th seeded team and had a noon start. Wayne C. ran leg 1, Ulf A., Chris F., Gary S., and John H. ran legs 2 through 5, respectively. I ran leg 6. 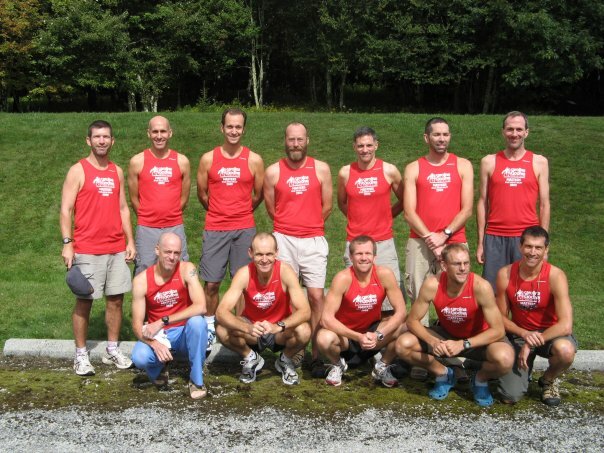 Gregg D., Tim M., Wayne M., Jim C., Rob W., and Kevin N. ran legs 7 through 12, respectively. I approached the exchange zone just as John came in sight, and he began calling my name. I had not warmed up, and was a little distressed and discombobulated. To add insult to injury, leg 6 was much more difficult than I had anticipated! The hills were steep, the gravel roads were rough, and the cars drove too close to the runners. Sounds like excuses, I know. Regardless, I was very disappointed in my performance, and I was regretting insisting to Jim that I be allowed to run with the team. Honestly, I can deal with disappointment, but not at the expense of others. I could write pages about the other runners, particularly those from our van. My calves were aching. This leg was obviously much easier, and a great leg for someone who likes downhill running as much as I do. My splits ranged from 5:13 to 7:58. There was one very steep uphill at about mile 4. Better still, I passed a dozen runners during this leg. I will say, though, that it’s nonetheless difficult to run during the night, even with a headlight, as I’m always concerned that I’ll take a misstep. My calves were aching, I was having a difficult time staying warm, and I was somewhat exhausted. This was my last leg though, so I managed to remain excited. I was waiting at the exchange, when who should appear but Jason P., from Team Mizuno. We were running the same legs, and I was fearful that we would indeed be running/racing. We compared our results from legs 6 and 18. As I was waiting at the exchange, I saw 4 runners approaching. The first was a runner from Norm’s Maggots, winners of this and every previous race. The next runner was John H.! That meant that I would more than likely be racing Jason. Ugh. It was a rough start, but once I talked myself through the pain, it got a little easier. I immediately set 3 goals: keep the Norm’s Maggots runner in sight, attempt to pass anyone that he passed (he passed 4), and, if possible, not be passed by Jason P. I achieved all 3 goals. I felt somewhat bad for passing the 4th runner—just before the exchange. I did offer my apologies. She gracefully accepted. I was exceedingly relieved to be finished my legs. A week and a half later, and I feel fine. I lowered my expectations from Chicago, and may actually run the marathon just for fun. At the most, it will be a training run for a possible Winter marathon.